Fun fact cartoon for the day. Did you know that Fidel Castro wanted to remove any signs of Capitalism when he took power of Cuba? So one of the first things he did was order all Monopoly Boards destroyed. In pretty much all communist countries even today, you would be hard pressed to find a Monopoly game anywhere. Am I the only one who thought of this song, after reading this? Wow. Didn’t know it’d embed the video. Good thing ‘Connect Four’ is still allowed. Maybe he’ll just put out his own version….y’know, with all that capitalism nonsense removed! Think you could draw that, Bearman? As I said before…it seems like every time I played Monopoly it turned into a communist regime. If I was winning my sister would say she would quit so I would have to give her half my money to keep playing and visa versa. Game takes too long to play. That is an odd fact that makes sense. What was his reason for not allowing newer cars to sold there. Actually I don’t know if he directly did much regarding car sales but I know the country has a great collection of 1950 era cars. Well I don’t think many of the communist countries were manufacturing new cars at that point so I figure he blocked all that as well. Well I didn’t know this, but it makes sense. I would hate for one person to make all our decisions for us and it appears that our crop of politicians are doing just that. Both sides of the aisle too. That is their job, and they do it well. So why am I paying them for that? Apparently they must be smarter than us. We pay them to rob us. Do not pass Go, do not collect $200! Go straight to jail! You would have thought he would have loved Monopoly ….”Go to Jail, go directly to jail”. I bet he would always pick the boot piece too. Not enough room. Why have jail when you can force labor out of people. II didn’t know that. 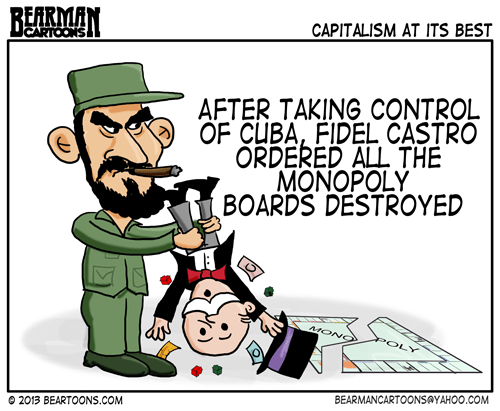 Maybe we should smuggle some Monopoly games into Cuba and make a fortune. Well, maybe a little bitty fortune. They smuggle cigars out, we smuggle Monopoly in. Maybe you could get a Monopoly on smuggling cigars. Unfortunately they were all recalled because at that size, they looked like little tiny vibrators. It’s especially interesting when you learn that the prototype of Monopoly — “The Landlord’s Game” — was actually created by an American socialist as an illustration of the perils of a private land ownership system. I never took him for a board-playin’ man. Nice work, Bearman! Maybe Castro was being backed by the “Yahtzee” folks! A very good friend of mine was raised in communist Cuba. Oh the fun stories he tells! It’s like one of those Debbie Downer skits from SNL. “When I was growing up in communist Cuba, we were only allowed three toys per year.” Then after everyone takes a moment to look around at each other he’d follow up with… “And only one was allowed to have batteries”. I showed him this comic and he got a big kick out of it. Mostly because he had an “Illegal” Monopoly set in his house. His parents made sure he never told a soul that his family had it. And whenever a piece got lost, his grandfather would carve a replacement piece out of wood. Wow…I could sit down with him for hours and listen. Great Castro drawing. I used to love Monopoly…that was way before video games though. Not constantly. Just a few hours a day in my spare time. In good old Capitalist countries we have scads of Monopoly games. Way too many versions. Simpsons, your favorite college team, etc. I was like Castro when our kids were teenagers. The way they would fight & argue over Monopoly disputes was terrible. One day I was so sick of their bickering over it that I grabbed the board & money & pitched the whole lot into the fire. You just can’t destroy someone’s favourite game & stay the good guy. That is obviously where Fedel went wrong. I think you would look good in one of those caps like Castro wore. Ha! Poor poor teens. I can vividly imagine everybody watching as the board, money, cards and pieces slowly burned. The question is did the little metal pieces melt too? And the second question is did your wife make you shell out more money to replace the one you burned. Q2. She was glad I burned it ‘cos she was sick of the fighting over it too. She agreed with me that they weren’t getting another one. Monopoly is fun when you can find friends willing to devote the time it takes to play. I’m with Castro (looks good, btw)! Burn ’em all! I like Monopoly but we never finish the game. Ever. It just drags on and on. I like it until all the property is sold. Oh boy. Forgot to capitalize. I’ll be taken to one of those small, green plastic houses and never be heard from again. Maybe the plastic houses are made of soylent green??? I suppose he put a hotel on Boardwalk, and didn’t want to give it up! There’s an online version, I wonder if he has tried to block it too? From what I saw 10 years ago, most people would not have access to computers or internet at home anyway. Their needs are all met, but no luxuries. I did not know until we visited Cuba that the government pays to bury all its citizens. I am a Canadian, but we were warned not to get our passports stamped or it could impede our entry into the US for a year after our visit to Cuba. Luckily for us, they only stamped our “Tourista” cards in & out. INteresting. I think the US needs to give up on this thing. It isn’t like we stop people from going to worse areas of the world.